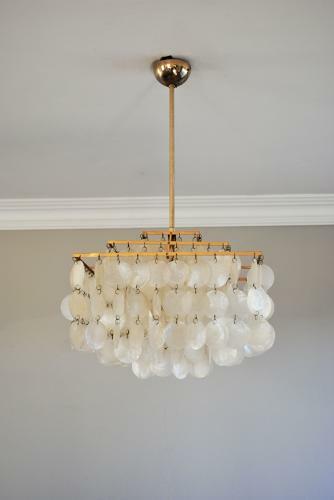 Mother of pearl pendant light. Mother of pearl light in the style of Verner Panton circa 1960. Tiered gilt metal frame supporting rows of mother of pearl discs of differing lengths. Brass rod and ceiling rose with a single bulb holder. The frame is 35 cm high.